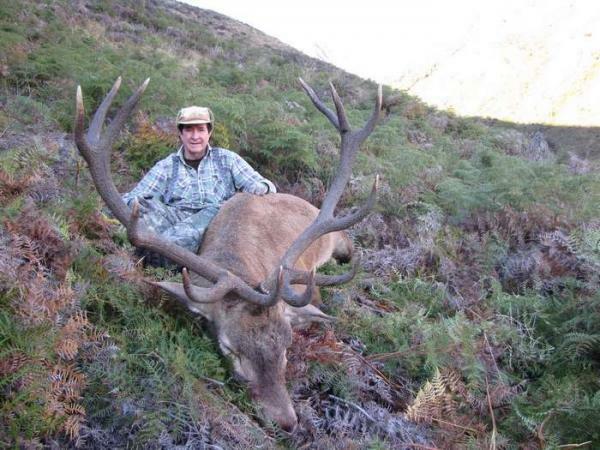 Lake Hawea Hunting Safaris unparalleled, Genuine, Free Range Red Stag Hunt for a mountain monarch. From Dalhousie Scotland to the mountains of Otago and beyond – this is the story of New Zealand’s greatest trophy red deer herd. A herd which over a century ago was providing local and international hunters with exceptional mountain hunting for world class Red Stag trophies. A trophy herd which was nearly lost to over population and in the space of ten years nearly lost to over hunting for the venison market; a herd now with the help of Lake Hawea Hunting Safaris and local landowners which is back on the map producing not only New Zealand’s, but perhaps the world’s, ultimate free range Red Stag hunt. Before European settlement New Zealand was a land of birds with no game animals and no land mammals, the only exception being 3 species of small bat. European settlers reached back to their homelands for game animals to populate the mountains and valleys. The Otago region was predominantly settled by Scots, so it was from Scotland that the first red deer to inhabit Otago were received. New Zealand was to become ‘A deerstalkers Paradise’ as well known New Zealand hunter Allan Harrison titled his 1956 book, which tells many stories of great expeditions hunting Otago Red Stags. ‘The Otago red deer herd is the only herd in New Zealand that is descended from wild stock. The other herds derive from ‘domesticated park-bred animals’, Quote from the inside cover of D Bruce Banwell’s ‘Highland Stags of Otago’, 1968. Above – Chris with the two Crawford trophies (left) and Innis trophies (right) from the 2017 season. Photo Chris with Donald Bells 1936 trophy Otago Stag from the Young Valley, Makarora. Length 45 inches, width 43 inches, points 14. Bell was one of the leading guides of the 1920’s and 30’s. Six fawns (or possibly 7) were released at Morven Hills in 1871. A number of fawns were captured during the months of May and June 1870 on Invermark Estate (Scotland) and later that year made the sea journey from London to Dunedin. The fawns were then transported by paddle steamer up the South Islands east coast to the town of Oamaru where they were loaded into bullock wagons for the trip up the Waitaki Valley and over the Lindis Pass to Morven Hills. The six fawns made up of two males and four females were released on firewood spur in the Lindis Pass, subsequent releases of Scottish stock were made in later years to add to the gene pool, The last being 3 young hinds in 1897. 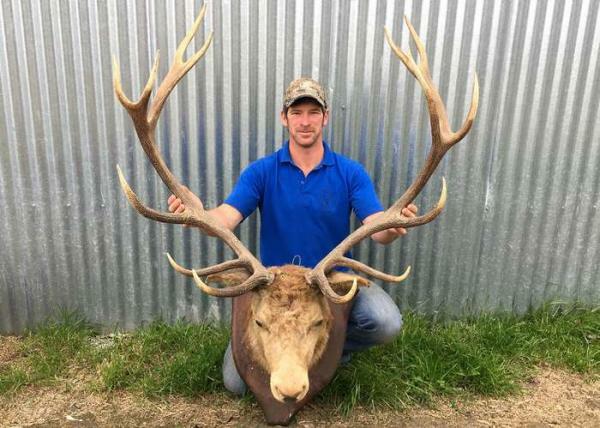 The first hunting licences were issued in 1889 and by 1894 international hunters mainly hunters from the British Isles and Australia began to visit New Zealand to secure a first class Otago Red Stag trophy. Naturally these international hunters needed transport to their hunting area’s and guides who knew the country, local farmers and sheppard’s offered their services. Early guides from Hawea Flat such as Peter Muir, Jim Muir, Donald McLennan and Donald Bell began to forge names as legendary hunters and guides. The area was often referred to as the Lake Hawea and Dingleburn Forests and the deer were also sometimes referred to as the Lake Hawea herd. A Royal stag (12 point trophy) was the baseline for these early hunters with many Imperial stags, (14 point trophies) 15, 16 and above trophies being taken, a minimum beam length of 40 inches was a benchmark. Beam lengths of 45 and 46 inches were not uncommon. These Scottish deer found their new home to their liking and immediately stags started producing impressive trophies, far superior to their homeland. At the 1924 Wembley, British Empire Exhibition none of the best 120 trophies from the British Isles exceeded 40 inches (102cm), yet New Zealand records listed a one year tally of 62 stags exceeding 40 inches. As the deer spread generally in a North West direction into the prevailing wind they inhabited famous catchments such as Timaru Creek, the Dingleburn, the Hunter Valley, the Ahuriri, the Makarora, the Albertburn and eventually over the Southern Alps into the Landsbourogh Valley and the Valleys of South Westland, including the Arawhata, the Waitoto, the Karangarua and the Jacobs to name a few. 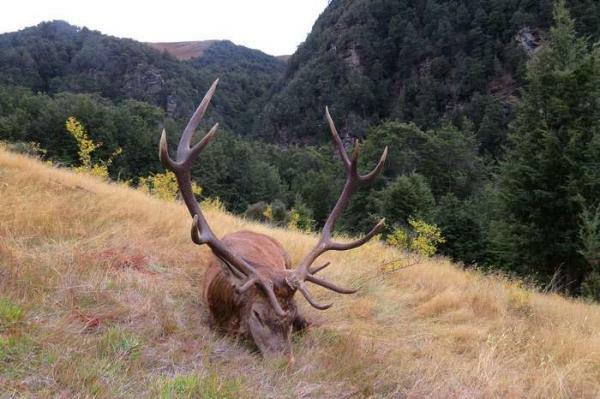 Above – Pat Stratton’s impressive 40 inch Royal Otago Stag from our 2011 season. Below – Steve Crawford’s beautiful 42 inch Royal Otago Stag from our 2017 season. 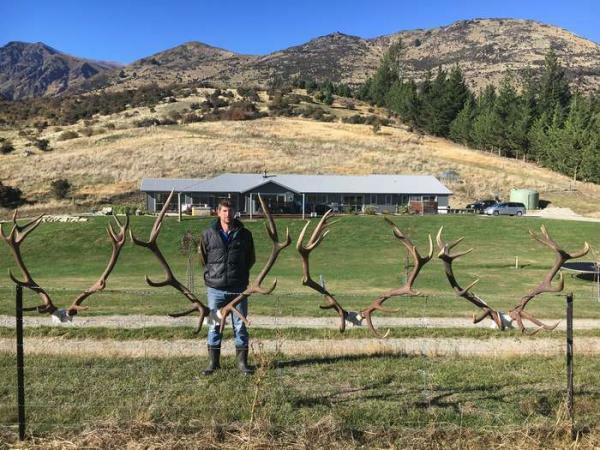 The Otago herd was expanding and as stags ventured into virgin country they continued to produce incredible trophies and trophy hunters and their guides followed them. The 1920’s and 1930’s were known as the golden days of stalking in Otago and South Westland. But back where it all started in the Lindis, Timaru Creek and the Dingleburn, the herd was out of control with an exploding population eating itself to an early demise, trophy quality had diminished and something needed to be done. In the 1906 season a rapid build up of deer numbers in the Lindis, Timaru Creek and Dingleburn areas was observed. The Otago Acclimatisation Society (responsible for liberating the deer and issuing hunting licences) received a letter from an Australian hunter A. B. Armytage recommending that a professional hunter be employed to care for and control the herd. Culling began in 1908 and in 1913 a contract to shoot 300 head was offered. In 1915 H. E. Hodgkinson and D. Smith shot 1,254 head. Between 1910 and 1920 around 15,000 deer were culled. World War 1, saw an end of culling as many of the early hunting guides went to war, New Zealand lost over 18,000 men from a population of 1.1 million. Brothers Jim Muir and Archie Muir were two of many local guides from Hawea who left for the war, Archie did not return. The Government soon stepped in and Government cullers were employed to control the exploding population of the Otago herd and other deer herds across New Zealand. In 1956, 91,000 deer were culled across New Zealand. Government shooting continued until the early 1970’s with varying results, New Zealand’s extremely harsh and remote back country meant that this was an extremely tough job. One change and new idea that bought deer numbers under control and as many local hunters will argue today, pushed the deer numbers too far in the opposite direction was helicopter venison recovery. This industry pioneered by local Wanaka resident Sir Tim Wallis involved shooting deer from the helicopter and recovering them from the back country with the helicopter to waiting chiller trucks and then on to the venison export market. In 1973 140,000 red deer were shot in New Zealand by venison operators, over 100 helicopters were competing with each other. There was no government regulation whatsoever, any deer could be shot, be it hind, yearling or stag the only regulation applied to mechanical checks on the helicopters. Helicopter venison recovery continues today. Deer numbers on public land are in my opinion probably in balance with nature, due to helicopter venison recovery. There are still no restrictions on what animals can be taken or quotas on how many can be shot, so deer numbers on public land tend to go in cycle with the export demand and price for wild venison. 1080 poison is also aerially applied to our public native forests, 1080 has an effect on deer numbers and is a terrible way for a deer to die. Unfortunately today with no game management on public land it is extremely difficult for a hunter to take a trophy Otago red stag or any red stag in New Zealand that is 12 points or above with a beam length exceeding 40 inches. 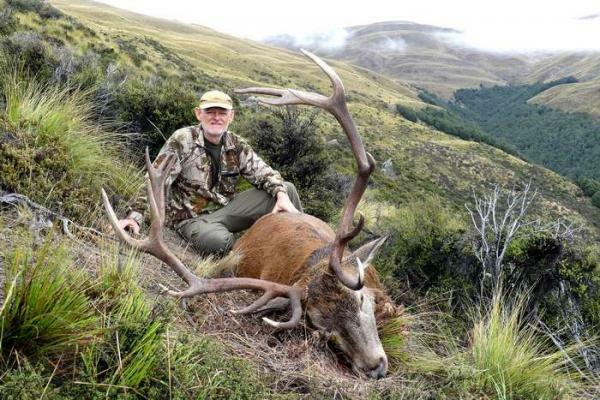 Certainly in the case of the Otago deer the genetics are there, the food is there, but when stags can be shot by foot hunters and helicopter venison operators at any age with no designated season, very few will every reach their trophy potential. So if you want to hunt a trophy free range red stag in New Zealand with a high chance of success you need to hunt on private property. But private property alone does not guarantee a good chance of success you need a property(s) where the deer have good genetics and some management. Optimum food needs to be available; this is generally not a problem as high country stations (large private properties) which have populations of wild deer look after there domesticated stock, so food/grass is available. The next hurdle is many station owners see deer as being in competition for food with their farm stock, so deer a killed indiscriminately. What you need and what we have developed at Lake Hawea Hunting Safaris with our property owners is a value placed on the deer that makes them a viable option for the station owners to have them exist on their land. This comes in two ways, a trophy fee payable to the landowner for trophy stags and meat value from venison recovery of surplus hinds and non desirable stags. Taking non desirable stags for a fee as management stags is also another option which adds value for the landowner. Gary Innis (Australia) with one of his many Otago Stag trophies, this 40 inch 15 pointer he took in our 2017 season. We like to score our free range Otago trophies on the official New Zealand ‘Douglas Score’, which only recognises free range trophies. Chris is an official Douglas Scorer. We aim to take trophies 12 points or above, with beam length of around 40 inches or above, just as guides and hunters did in the ‘golden days of stalking’ nearly 100 years previous. These stags will score from 280 – 340 Douglas score, anything above 300 being considered a first class trophy. Currently we are very proud and privileged to be working with two large properties which make up a large portion of the area originally known as the ‘Hawea Forest’ to early hunters or ‘stalkers’. The Otago free range red stag hunt we offer is second to no other free range red stag hunt in New Zealand, I firmly believe that. Trophies are of the highest quality, the hunt itself is of the highest quality, terrain and scenery is breath taking, roaring and rutting is exceptional, deer numbers and numbers of trophy stags epitomize what can be achieved with management of wild deer. Small populations of Tahr, Chamois and Fallow deer inhabit this area and can be added to a hunt. 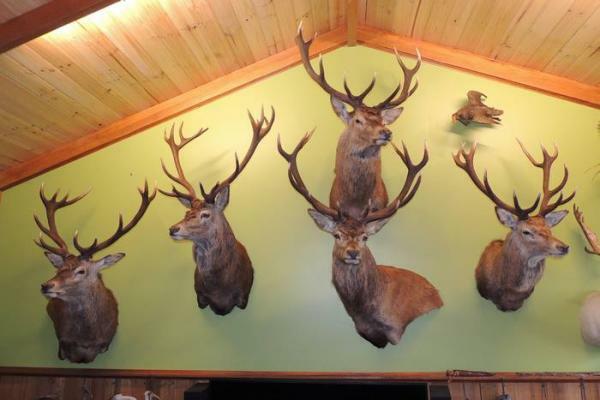 Steve Crawford’s impressive collection of free range Otago Red Stags, all taken with Chris McCarthy of Lake Hawea Hunting Safaris in recent seasons. The only exception is the stag far left which Casey Clark of Colorado guided Steve onto in 2016, while guiding for Lake Hawea Hunting Safaris, the photo doesn’t show all the top tines on this stag, it is actually a 15 pointer.